Each border comes with one spike. - Made from recycled rubber. Available colors: Black, Brown, Green, Red. - Patent pending inter-locking system creating a “seamless look”. - Flexible rubber allows for graceful curves. - Stackable design to handle varying landscaping heights. - A safe alternative to hard-edged materials that can hurt kids. - Stakes securely into place. 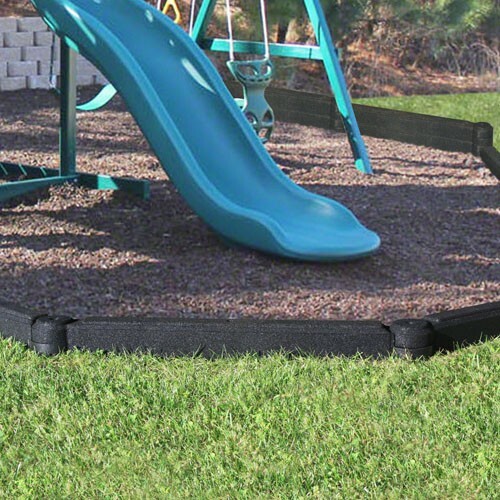 - Elegant design compliments any landscape or playground. - Installation is quick and easy. - Will not rot or breed ticks, termites or other insects. - Neutral dark tone is compatible with natural surface colors. The Inter-Locking system overlap and is held securely in place with a stake through the middle. This allows you to pivot the angle of each border in any direction. Each border covers a linear length of 42”. You can even end your border with an additional “end cap” and stake. To increase the height of your border simply stack and inter-lock a boarder on top of the first row to create a total height of 8.25”. We recommend an additional stake in the middle of the border and an “end cap” if not connecting to another border. How Many Borders Will You Need? Step 2. Determining the quantity of borders required: Each rubber border has a linear length of 42”. (The total length of each border is 48” with an over-lapping inter-locking system.) Divide your “total linear length” (Step 1), by 42” and the total is the quantity of borders you’ll need.